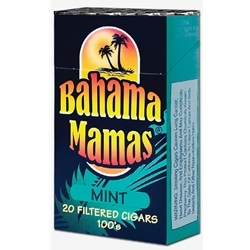 Made with an Island style and flavors at mainland prices, Bahama Mamas Filtered Cigars stand out on any shelf! Using an aged Sumatra tobacco wrapper, Nicaraguan Habana binder and smooth Olor fillers, each of these Bahama Mamas discount filtered cigars are created with a surprisingly distinctive full flavor taste, allowing for a smooth finish with a pleasant aroma. Bahama Mamas Filtered Cigars range in styles and taste, so attractive these filtered little cigars are creating a tropical storm like buzz! Each of these discount filtered cigars are available in 6 Island Styles and Flavors, Full Flavor, Mint, Smooth, Vanilla, Cherry and Rum! Every day smokers are trading in their expensive retail brands, and trying these discount filtered cigars. A great way to save money in an over-priced world. Here at Smokers Discounts we believe you should too! We’ve made it easy and affordable to buy filtered cigars online. Call us for more details!